The main conclusions and the cartographic documents contained in this page are extracted from Samuel Toucanne's thesis and resumed in the collective article Toucanne S. And alOn 2009 (see biblio). These works are available on-line. In blue on the plan: the glacial episodes. 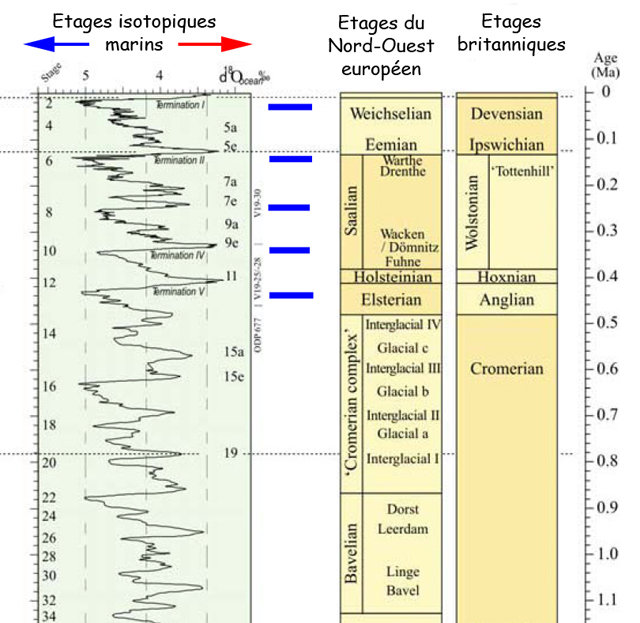 Several alternations "glacial period / interglaciaire" during the Quaternary are responsible for the morphological shaping of Manche and thus cliffs which line her. Here is an outline of the last glaciations which are also best known. During the glaciation elstérienne, the British and Scandinavian skullcaps in the North Sea unite. This implies an important reorganization of the networks of drainage of the European west central rivers and the creation of a glacial lake in the pond of The North Sea, between the southern part of the skullcap and the anticlinal Weald-Artois. If the origin and the chronology of the opening of the anticlinal Weald-Artois and the training of the strait of Pas-de-Calais are still widely discussed, numerous authors consider however that the break of the anticlinal Weald-Artois would date the glaciation elstérienne and the overflowing of the glacial lake previously evoked. 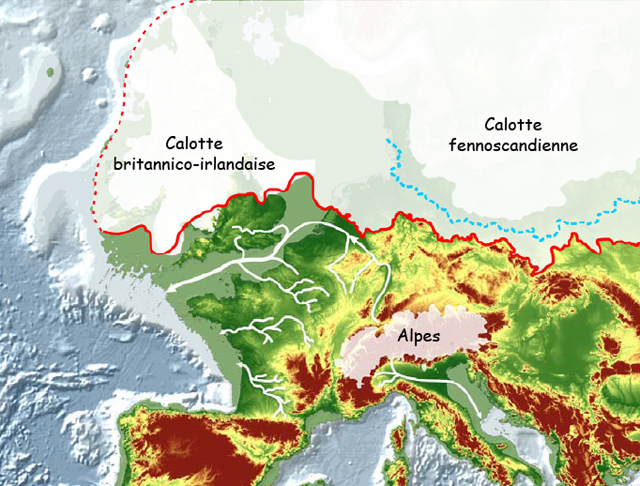 The glaciation saalienne is understood between the periods moderated (interglacial periods) of Holsteinien and Eémien. 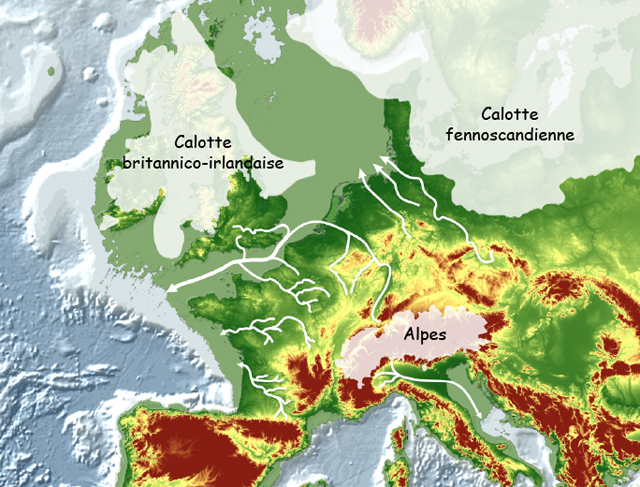 Saalien includes the second the most important glaciation of the Quaternary after the glaciation elstérienne. A skullcap of major ice extends over the northwest of Europe during this interval. This glaciation is classically cut in 2 successive glacial advances: the glaciations of Drenthe and Warthe, respectively correlated to the Older Saalian glaciation and the Younger Saalian glaciation. The glaciation weichselienne is the last glaciation known in Europe. She succeeds Eémien and precedes the current interglacial period. The beginning of Weichselien is generally proposed towards 116 ka in the continental stratigraphy. Of numerous reconstructions paléogéographiques centered on the North Sea show that the latter is either englacée, or on the contrary free of any ice. The union of the British and Scandinavian skullcaps in the North Sea was dated towards 30 - 25 ka. From 20 ka, the set of skullcaps and European glaciers knows a significant retreat which marks the beginning of the déglaciation. Numerous studies show a significant acceleration of the déglaciation from 18,3 ka. Later 16 ka, the British and Scandinavian skullcaps as well as the set of the European glaciers move back again in a important way to occupy only the mountainous parts of Europe, the North of Scandinavia and the Scotland. Two phases of resumption of the advance of skullcaps and European glaciers are centered on 16,5 ka and 12 ka, respectively at the time of the event of Heinrich 1 and Younger Dryas.